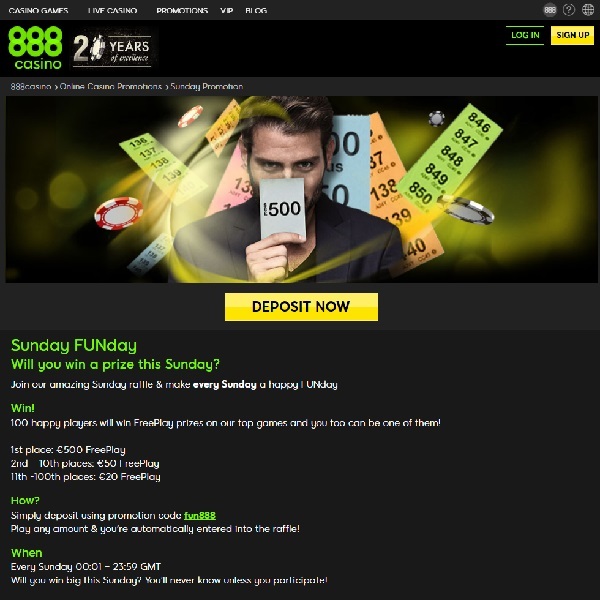 It is Sunday Funday at 888 Casino and they are giving you the chance to earn up to €500 of free play on some of their top games. All you have to do is make a deposit at the casino using the code ‘fun888’. Then play any amount on the games and you will be entered into the raffle. There is a huge top prize of €500 free play up for grabs, second to tenth prizes of €50 free play and eleventh to one-hundredth place will win €20 free play each. The prize draw will take place on Tuesday and the free play can then be enjoyed on games such as European Roulette, Multihand Blackjack, Elm Street, Casino Reels, Ultimate Universe, Millionaire Genie, Jungle Goals & Snack. Best of all many of these games are linked to progressive jackpots so the free play could lead to some huge winnings.